What do you get when you combine Madlib productions, classic Brasil standards and the drummer of Azymuth Ivan 'Mamao' Conti? Filled with songs from the greats of Brasilian music of the mid sixties to early seventies. Luiz Eca, Chico Buarque, Joao Donato, Baden and Vinicius, Marcos Valle, Dom Um Romao, Airto even George Duke gets a look in, and of course Azymuth. Madlib is an artist that gives one new ears every couple of years if you choose to pay close enough attention. 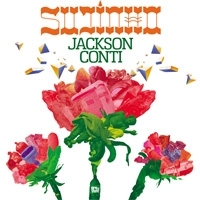 As for Jackson Conti, Madlib & Azymuth will blow your heads open ! More info coming soon. Watch out for the limited 7" which is dropped on the 13th of March !!! Note : Jackson Conti are Madlib and Mamão from Azymuth. The album contains both classic Brasil standards performed by Madlib & Azymuth as well as new productions, and is supported by a EU tour with Madlib, Azymuth, J‐ROCC and B+. Back in 2002 that wasn't so obvious. At that time he was beginning the experiments that led to the Yesterday New Quintet records from 2003 to today. Peanutbutter Wolf used to slide Coleman and myself CDs of those early "rehearsals" as Madlib would call them and we spent many hours dissecting and discoursing on them and how he was changing the music. When the possibility of the Keepintime crew going to Brasil came up I asked Madlib one night outside the Rootdown if he wanted to go. "Cmon man…. Azymuth is one of my favorite groups" he confided. I had seen many Azymuth records over the years, the Rio de Janeiro trio on Milestone with some dodgy looking covers. I knew their proto-house anthem Jazz Carnival but they weren't my favorite group. Music has a beautiful way of making you re-evaluate what you may have discarded. Madlib is an artist that gives one new ears every couple of years if you choose to pay close enough attention. I'm happy to say that in regards to Azymuth - Madlib blew our heads open. The next time I saw him at the Rootdown, he slipped me a CD of covers. All Azymuth. To this day that CD still makes me giddy. Entrando Pelo Janela from that session made it onto the Keepintime remixes. Madlib had gone through the Azymuth catalogue and taught himself to play his favorite songs and then recorded it. Okay. Now I'm back at the record store frantically looking for those dodgy looking covers. When we went to Brasil to recruit drummers the only name I knew I wanted for sure was Mamão. Mamão is the drummer of Azymuth. I didn't know how to pronounce his name right and indeed my pronunciation of Azymuth (Azze-muchi if you need to know how its done!) confused most Brasilians. João Parahyba of the legendary Trio Mocoto picked up the phone and called him for us and from there Ivan 'Mamão' Conti was a part of the project. Mamao is a fantastic drummer and a warm generous person. That scene in the film where we played him the Madlib CD is a beautiful emblem of the spirit of the Brasilintime. Mamão reacted with genuine excitement at the music - singing and playing percussion along with it. Even calling in his wife to hear. We knew that a Madlib, Mamão collaboration would only take time and organization. Mamao of course isn't simply the drummer of Azymuth. He has a long career in the studios of Rio that stretches back to the Jovem Guarda era with the rock group the Youngsters and which includes sessions for Roberto Carlos, Marcos Valle, Maria Bethania, Hyldon, Edu Lobo, Chico Buarque, Gal Costa among many others. He is also the drummer on the Dom Salvador record with the monster break! He continues to be active playing and producing many projects for Far Out Records. In 2006 after the Premiere of Brasilintime in Sao Paulo, Madlib, Coleman and I went to Rio. We had two reasons to be there, to play at MD2's record release party and record with Mamão. On a rainy humid Rio evening we convened and after some deliberations Mamão played an hour and half of rhythms. The excitement in the room was palpable as he went through his paces. Lots of Whooos were heard and pounds were swapped. Madlib then played a new CD of tracks that he had been working on with this project in mind and there was one that stuck with Mamao. Segura esta Onda is that track and it is really a tribute to Azymuth. Mamao ended up singing on it. It was a great night and within two months Madlib had turned those rhythm tracks into the album you have in your hands. Filled with songs from the greats of Brasilian music of the mid sixties to early seventies. Luiz Eca, Chico Buarque, Joao Donato, Baden and Vinicius, Marcos Valle, Dom Um Romao, Airto even George Duke gets a look in. And of course Azymuth. This a very special set of music. I hope you have as much fun listening to it as we did watching it being made….